Viva – that’s the rockresort for us. Urbanity and nature mix together in harmony. Family-friendly and situated directly at the LAAX lift station, the rocksresort redefines the alpine holiday. We are looking forward to welcome you again from 28 June – 20 October! Comfortable apartments with style and hotel services. Equipped and furnished with everything you need for a holiday with family and friends. The LAAX liftstation is right in front of you. There are also numerous bars, restaurants and shops in the rocksresort. Here everyone will find just the right thing after a day full of action. The rocksresort Design Hotel in Laax in Canton Graubünden reinterprets alpine lifestyle and celebrates it with a passion. The modern apartments offer a living quality of the highest level – restaurants and shops are in the immediate vicinity. The rocksresort combines urbanity in a stunning natural environment. Many activities and offers such as shops, restaurants or bars are directly within the rocksresort offer endless possibilities – from morning to night. Recreation or action? Why not both! The rocksresort impresses with its unique design and regional materials. Experience the exclusively furnished apartments for 4, 6 or 8 persons directly at the Laax lift station, the ideal starting point for your holidays. Let us spoil you and enjoy your stay with us. For the first time in 2018, selected hotels were eligible for the „World’s Best Green Ski Hotel“. The inclusion of this category underlines the increasing relevance of the topic of sustainability in the tourism industry. 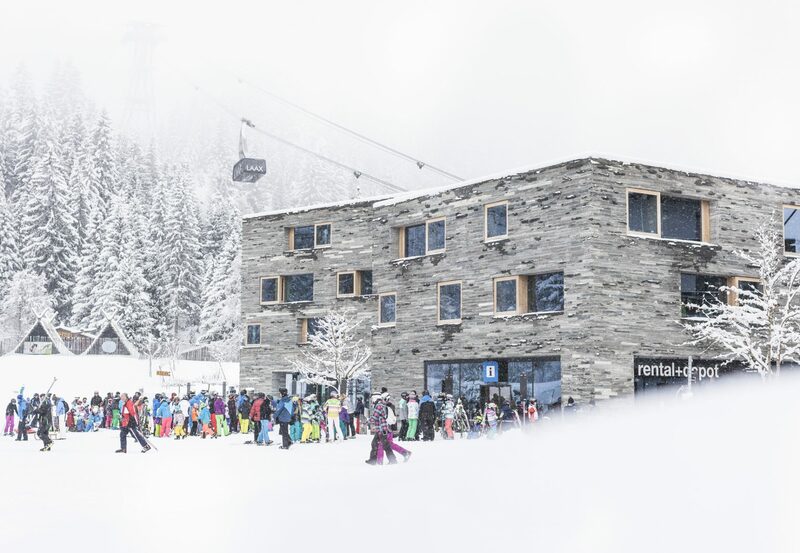 The rocksresort in LAAX, which takes a responsible approach to its resources and the environment and acts in accordance with the Minergie standards, took first place in this category „World’s Best Green Ski Hotel 2018“. The summer is characterized by activity, fresh air and a wonderful time with endless possibilities. In the rocksresort you will fall from your room door directly into the breathtaking nature of the destination Flims Laax Falera. By the way: We are also very proud of our recommendation rate of over 96% at HolidayCheck! In addition to the offers in the resort, the Laax Flims Falera region offers countless activities and events all year round, with which you can make your stay unforgettable and individual – in summer as well as in winter.